Back in the 1950s, when America was racing towards a Jetsonesque ideal of modernity and futurism, furniture maker George Nakashima was quietly going in the opposite direction. He established a small community around family and work in Bucks County, Pennsylvania, and from there, across the next four decades, produced a completely unique body of work. Nakashima furniture remains as remarkable now as it was then: It embraces modernism while standing against the forces of mass production and retaining the quality, intentionality, and humanity associated with our most admired artisans. But Nakashima was not only an artisan: He was an artist, too, and the attention and prices that his furniture is beginning to draw only prove it. After all, would anyone risk spilling merlot on an $822,400 table not created by an artist? 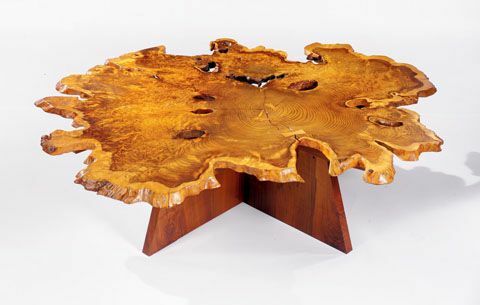 That was the price that Sotheby's New York auctioneer Tobias Meyer recently knocked down for Nakashima's masterful Arlyn table, a rich, oversized cross-section of redwood burl (originally from California's Muir Woods) that the craftsman executed in 1988 for his most notable patrons, Dr. Arthur and Evelyn Krosnick of Princeton, New Jersey. At the December 16, 2006, auction, New Life for the Noble Tree, the bidding was swift, as one Nakashima after another--each created for the Krosnicks to replace vintage pieces lost in a 1989 fire--came and went amid a flurry of phone offers and prices that climbed from high to higher to highest. The low pre-auction estimate on the Arlyn table was $300,000, and over the course of the bidding it was not unusual to see sideboards, coffee tables, and black-walnut Conoid chairs (a signature design going back to 1961) fetching twice the anticipated prices. This was, after all, perhaps the most important Nakashima auction ever held, coming at a time when all things Nakashima have been boostered by such fans as Steven Spielberg and Diane von Furstenberg. The 46 lots--curated by James Zemaitis, responsible for two previous Nakashima auction records and featured in the Fall 2005 issue of Men's Vogue--represented not only Nakashima's final work (he died in 1990 at age 85, in the midst of rebuilding the Krosnicks' collection) but the moment when he handed off operations to his daughter, Mira, who completed many of these masterworks. "My wood is better now, and my work is better now," the furniture maker said of this late phase, in which his designs tilted toward the Baroque, with riotous free edges, a profusion of butterfly joints, and daring explorations of such exotics woods as Persian walnut and Oregon myrtle. At the final rap of Meyer's gavel, New Life for the Noble Tree cleared $2.6 million. The sale of the Arlyn table--to Florida collector Rudy Ciccarello--set a new auction record for the designer. Though trained as an architect, Nakashima began making furniture while sequestered in an internment camp for Japanese-Americans in Minidoka, Idaho, during World War II. (He grew up in Spokane, Washington, and earned a masters from MIT in 1930.) When offered the chance to relocate to Pennsylvania, he and his wife didn't hesitate. What they found in the rolling hills, old-growth forests, and sturdy yet elegant stone structures of Bucks County became a lasting foundation for their lives and work--work that continues, thanks to Mira Nakashima and the Nakashima Workshop in New Hope, Pennsylvania.